The Big Issue is a fortnightly, independent magazine that is sold on the streets of Australian capital cities by homeless, marginalised and disadvantaged people. It is very good reading and contains some high-quality journalism. The idea is you give them $7 bucks, they give you a great magazine, and they get to keep $3.50. Everybody wins. 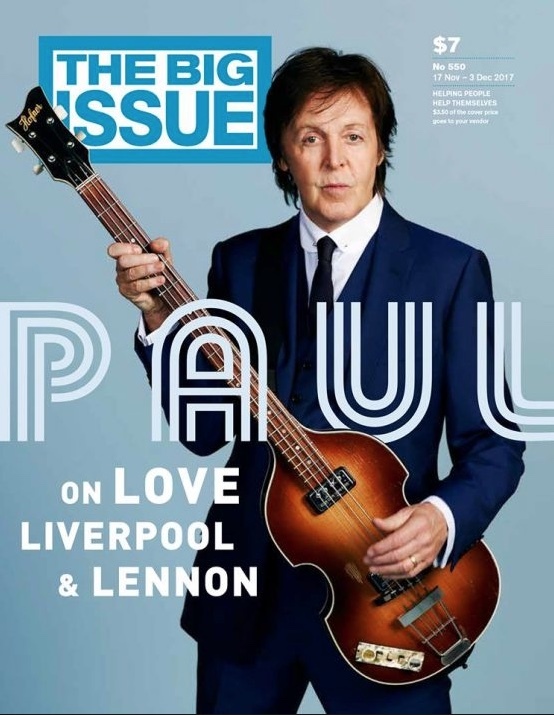 Issue 550 of The Big Issue contains a very personal ‘Letter to My Younger Self’ where Paul reflects on his teenage years, the music, the girls and an amazing dream he shared with John Lennon. The magazine also invites three Beatle tragics – Yon from the band Tripod, Davey Lane from You Am I, and former Big Issue editor, Alan Attwood – to write about the Paul McCartney song that most inspired and impacted them. So, if you are out and about and spy one of the sellers on the streets, why not grab yourself a copy. This entry was posted in Beatles, Beatles Collecting, Beatles Music, Paul McCartney and tagged Beatles, Beatles Collecting, Magazines, Paul McCartney, The Big Issue by beatlesblogger. Bookmark the permalink. Loved you all when I first heard you all.